On a daily basis, we'll try and add a brief, helpful pool or spa tip or product suggestion and retain posts, from the past 30 days. We hope that you'll find the information and links, timely and helpful. Click on any link or image, for complete details. Everything is Factory-Fresh. Don't settle for less!!! Do you know what's in your water???
. . . the Hybrid-Epoxy Pool and Spa Coating that lasts!!! Dealing with well water or faced with staining and/or source water, that contains iron, copper or manganese? 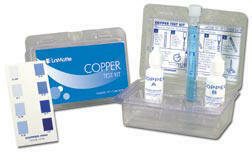 A METALTRAP Stain Reversal Kit can remove the stains and the metals, from surfaces and the water. 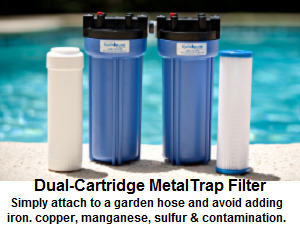 Next, use a Dual-Cartridge METALTRAP Filter, to treat all new water additions, keeping metals out and sediments and avoiding future recurrences. 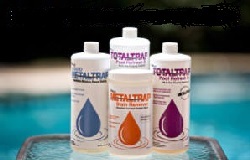 Use the METALTRAP Stain Reversal Kit to remove any stains, as well as metals and phosphates, from the pool or spa water. Why put up, with unsightly stains. Simple attach to a garden hose and avoid adding iron, copper, manganese, contaminants or sulfur, with new water additions. Washable or Replaceable cartridges.. Choose from 5 models that perform 5-7 different tests. Choose the one that's best suits your pool or spa homeowner or professional needs. Choose from 5 models that perform 7-11 different tests. 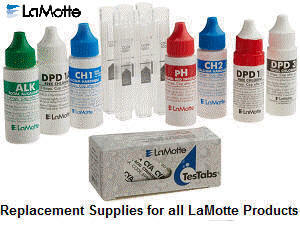 Features larger supplies of testing chemicals and some helpful, informational testing aids. 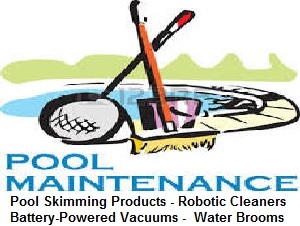 Do you have a pool or spa, using traditional sanitizers, including a salt chlorine generator? 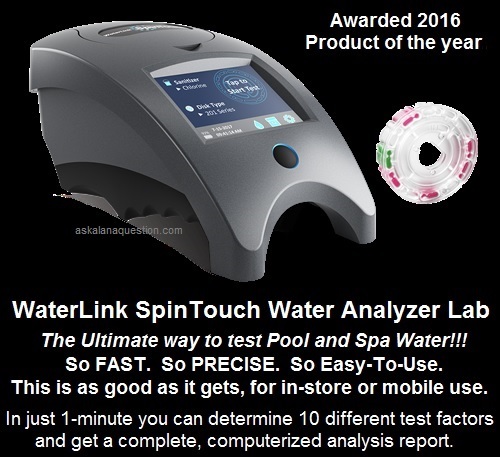 This is the best tester, ever developed, for pools and spas. Why??? Because it just takes a single, 3-ml sample of water and one minute to test the salt level and up to 9 other important test factors, such as: Free and Total Chlorine, Bromine, pH, Total Alkalinity, Calcium Hardness, Cyanuric Acid, Phosphates, Borates, Iron, Copper, Biguanide and Biguanide Shock. No other tester does all this, with such ease of use. That's why it is the best. In Stock, at this time. New lower pricing!!! From $699.00. Disks, Software and Web Subscription Service are sold separately. Don't delay!!! Want a much smarter way to use chlorine in a spa or swim spa? 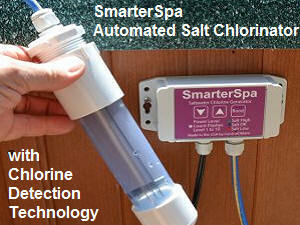 The SmarterSpa salt chlorine generator. with Chlorine Detection Technology, is smart enough to produce chlorine, only when needed. You'll never over-chlorinate again. 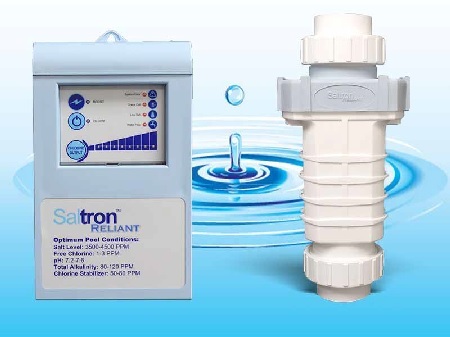 It monitors the chlorine level and turns on and off automatically. Needs No Installation. Plug-n-Play ready to go. Is is too hot, for you to keep up with the sanitizer demand? 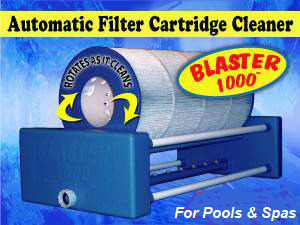 Want to improve upon traditional pool sanitizers? The addition of a Salt Chlorine Generator, Floating, Solar UV Sanitizer, Ultraviolet (UV) Sterilizer or Solar-Powered Mineralizer can reduce chemical usage, improve water quality and provide better algae control. 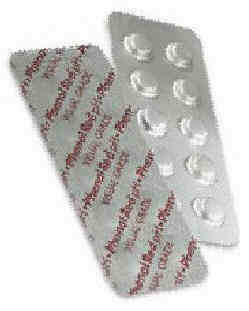 Used in combination, with each other or traditional products, they clearly produce better results and fewer problems. 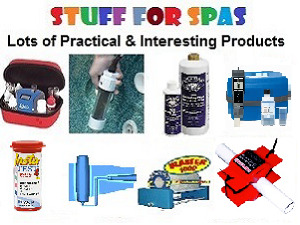 Looking for some practical and useful spa accessories? Need a Gift Idea? Check out these interesting items and more. You'll find the latest in water testers, battery-powered spa vacuums, salt chlorine generators, spa cover lifters, scenic backdrops, spa-side rails, automatic filter cartridge cleaners and more. Is your Pool or Spa leaking? 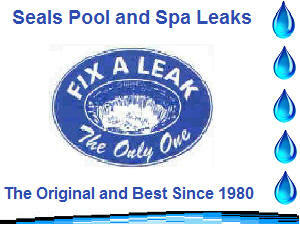 Or are you unsure about whether or not your pool or spa has a leak? Do the bucket test. It cancels out the effects of normal evaporation and provides the true extent of the water loss. It's a simple and reliable test. Fix A Leak has been sealing all types of leaks, for over 35 years. The original and best. Available in pool and spa sizes. This is the better way to do chlorine, in a Pool or Spa!!! This Salt Chlorine Generator is "smart enough" to only produce chlorine, when it is actually needed. Do you want real chlorine automation, for your spa, swim-spa or pool, up to 17.000 Gallons? 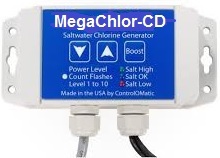 The MegaChlor-CD salt chlorine generator features Chlorine Detection Technology, that monitors the actual chlorine content. Never over chlorinate again. 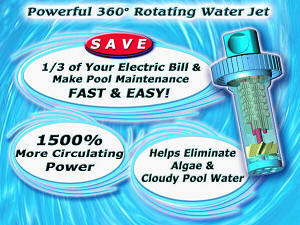 It's simply a better, easier way to keep the pool clean, while reducing your energy and chemical costs!!! Isn't Sparkling, Crystal-Clear Pool or Spa Water what you really want? And don't you want to use fewer chemicals? Nano-Stick Clarifiers could be just the product, to help you reach those goals. Nothing to install. Simply hang the 10-inch spa clarifier stick or 32-inch pool clarifier stick, in the pool or spas. That's all it takes and lasts for about 4-6 months. cleans the surface, preventing debris and insects from sinking to the floor. This Remote-Controlled Pool Surface Skimmer is fun to use. The kids will actually want to clean the pool. Rechargeable. This Return-Jet Powered skimmer creates powerful skimming action. Debris collects in its easily emptied bag. For all pool types. Leaves and debris ending up in your pool? Keeping the area around the pool cleaner means less debris getting into the pool. Isn't that what you want!!! A Water Sweeper Broom attaches to an ordinary garden hose and water sweeps 3 times faster, while using 1/3 of the water. Use it to clean pool decks, patios, walkways, chemical spills, winter pool covers, solar pool blankets, garage floors and, even, shingled roofs. Choose from 4 (four), quality, American-Made models. Want a better way to use chlorine, in a spa, hot tub or swim spa? A salt provides better control, less odor and eliminates the measuring, handling and storage of chlorine products. Choose from an affordable selection of models, including several that are Plug-n-Play ready, with Automatic Chlorine Detection Technology. No Installation Required. 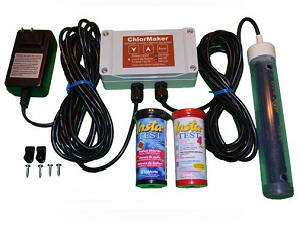 Do you use a Salt Chlorine Generator, in your Pool, Spa or Swim-Spa? Proper salt testing helps assure proper performance and helps extend the life of the salt-cell. 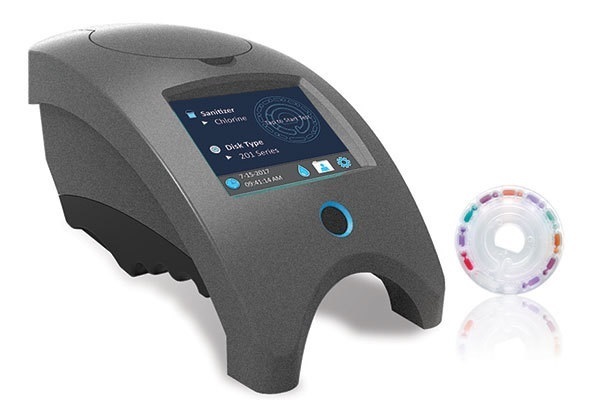 Choose an easy-to-use, all digital, dip-n-read Water Chemistry Tester, that only requires one press of a button. 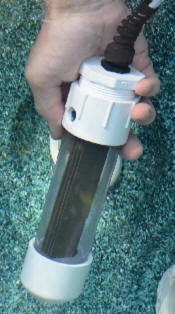 The SafeDip Pool and Spa Tester performs tests for: Salt, TDS, Free Chlorine, pH, ORP and Temperature. All-Digital. Uses no testing chemicals. Six tests in just minutes. Why struggle with hard water issues, scaling and cloudy Pool or Spa water? A Magnetic Water Conditioner helps prevent and remove scale deposits, improves water quality and reduces chemical usage. No moving parts and uses no energy. Simply clamp on to install. For Pools, Spas, Fountains or The Whole House. Set of 4 magnets clamp around any return line, up to 2-inches in diameter. For use in Pools, Spas, Hot Tubs or Swim Spas. Sets of 8, 12 or 24 more powerful magnets clamp around pipes up to 1.5-2.0-inches. Models for use in Pools, Spas or the Whole House. Don't you want to make pool or spa maintenance easier? Who doesn't? It's easy to Improve Surface Skimming, with the right product. A Robotic Pool Cleaner makes pool vacuuming virtually automatic. A Portable Battery-Powered Pool or Spa Vacuum eliminates the hoses, cords and tangles. A Water Sweeper Broom washes away debris, from decks, patios, walkways and pool covers, and cleans up chemical spills. Don't fight a losing battle, against algae!!! Here's how to control algae, while using less chlorine? A Solar-Powered Pool Purifier/Ionizer/Mineralizer helps control algae, using Dual-Ion purification, even when the chlorine is low. Use less chlorine and have fewer sanitizing problems. 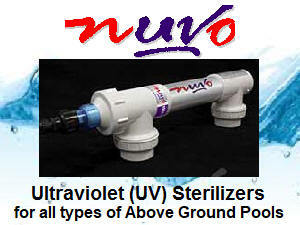 Two models, for use in all types of pools, up to 32,000 Gallons. On sale now. Make your pool beautiful!!! Create a wonderful, new look. Want the appearance of a real tile mosaic, without spending a fortune, in any kind of pool? A drop-in a Premium Pool Graphic Mosaic Mat looks like the real thing, in any type of pool. Simply place in the pool and position, with a pool pole. It's weighted, now even more, to better keep it in place. Choose from 3 sizes and a variety of designs. Premium Pool Graphic Mosaic Mats, in 3 sizes - Just Drop In Place!!! How much chlorine does an inground or above-ground pool need? One size doesn’t fit all. Chlorine needs vary with the seasons. A salt chlorine generator allows you to vary chlorine output, to match the changing demands. Three in-line models sized for up to 20,000, 25,000 or 40,000 gallons. Get better results and more control, while eliminating odors and chemical build-up problems. This is the better way to do chlorine!!! Leaves and debris sinking to the pool floor? A battery-powered leaf vacuum is what you need. No hoses or power cords to tangle. Operates independently of the pool pump. Don't clean a messy pool, without one. Want an easier way to clean up the whole pool or just do some spot-cleaning? Tired of hoses and power-cord tangles? Battery-powered hand vacuums are cordless and hoseless and attach to poles, for a longer reach. Choose from a variety of nine (9) portable models, to suit every budget and every pool or spa homeowner or professional requirement. No Tangles 4 Models suitable for all spas, swim spas, fountains or spot cleaning. No need for hoses or power cords. Simply easier!!! Are you concerned about all types of aquatic Electrical Hazards? The Shock-Guard 24/7 Electrified Water Detection and Alarm System helps guard against the hazards of electrical malfunctions, by sounding an alarm, should hazardous conditions be present, in your pool, spa, dock or marina. Three models to suit a variety of needs. Shock-Guard Alarm Unit The Shock-Guard 24/7™ Volt Detector and Alarm System warns of electrical hazards and creates peace of mind and a safer aquatic environment. Shock-Guard 24/7™ monitors the pool or spa water, for the presence of electricity, 24 hours a day. If as little as 1.7 volts of electric current is detected, in the pool or spa water, it sounds an alarm, using its built-in buzzer, warning of the potential danger. Shock-Guard 24/7 ™ will continue making loud buzzer chirps, every 5 seconds, for up to 24 hours or until the electrical source is stopped or the unit is deactivated. 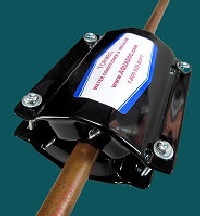 An outdoor 6-12V DC siren (100 db) can be attached to the unit, making an even louder warning sound. This makes it your first line of defense. The unit includes detailed installation instructions. However, installation by an licensed electrician is recommended. Installation takes about 30 minutes. Anything not included, for installation, is readily available. 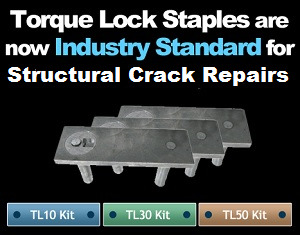 in home improvement or electrical supplies stores. Want to reduce chlorine and chemical usage? A Floating Solar UV Sanitizer, with BioPhotonX™ UV Light Conversion Technology, captures and magnifies ultraviolet light, breaking down a portion of the water molecules and creating Free Radicals. These active Free Radicals attack, weaken and inhibit reproduction of algae and bacteria, allowing you to use less chlorine and fewer chemicals, in your pool or spa. Make your kids want to clean the pool? Falls leaves can be a problem. 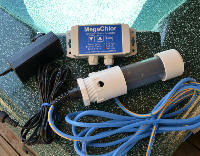 It can be fun, when using a remote-controlled pool surface skimmer. The Joy-Stick Controller will turns this in a fun thing. Operates on rechargeable batteries, which are included. Imagine kids wanting to help clean the pool? It can be done!!! ● For all types of pools and small ponds. ● Fast, Easy and Fun!!! ● Powered by a heavy-duty Ni-MH rechargeable battery pack. ● Includes charger and battery pack. ● Easy to use joy-stick controller. ● Full 1-year factory warranty.